Well, I can hardly believe it’s already Friday…and December 2nd…but here we are. Time’s flyin’ by, isn’t it?! So let’s get on with this party! And don’t forget, this week there’s a completely separate section below for upcycled projects. You can link any home-related upcycled project you’ve done. They don’t even have to be recent! But first, let’s check out some great projects linked up from two weeks ago (because I completely forgot last week’s party…oops!!). This $20 Goodwill cedar chest got a fantastic makeover with stripes at Because I Like To Decorate. I love stripes! Let’s just say Michell at Girl In Air is one ambitious DIYer. Yep, that’s a decoupaged piano!! This welcome window from Artsy VaVa adds just the perfect touch to the front porch. This “give thanks” subway art from Sand & Sisal was inspired by a piece from Pottery Barn. Truth be told, I like this one better than the one from Pottery Barn. If you missed these two Cape Cod style room makeovers from Soulstyle, you’ll definitely want to check them out! This week we have two different categories! 1) Recent DIY Projects, Room Makeovers, Recipes, etc. 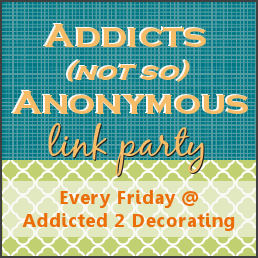 Thanks for hosting such a fabulous link party! Glad I follow your blog, so I got here on time (I'm normally late to parties, linky & otherwise). Thanks for hosting! Love the mod podged piano! LOVE the piano – makes me want to take lessons! Linked a couple of my favorites tonight. Thank you for featuring the Cape Cod rooms Kristi! Thank you for featuring my Welcome Window and for hosting the party! Added a monogrammed tray that I dearly love after its facelift! Thanks for hosting. Some great ideas on here! Some amazing projects here…and that piano? YOWZA!